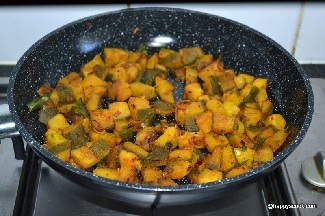 Mezhukupuratti is one of the dishes in Onam Sadya and the word literally, means 'coated with oil'. The vegetable is boiled with little water and then it is tossed in oil with few seasoning. The very famous mezhukupuratti's in Onam Sadya are made with Raw Banana, Beans and Elephant Yam. Today we will see the preparation of the simple and yummy Kaya (raw banana) Mezhukupuratti. Checkout my Tamilnadu based Raw Banana Podimas too. For more Onam Sadya recipes, visit this link. 1. Peel the skin of the banana and chop it into small pieces as shown below. 2. In a pan, boil the raw banana in a little water along with turmeric powder and salt. Cook until the banana is soft and the water is absorbed completely. Meanwhile, chop the shallots and garlic. 3. In a pan, add the coconut oil and allow the mustard seeds, curry leaves to crackle. Then add the chopped shallots and garlic. When the onions turn transparent, add the red chilli poder. Finally, add the parboiled raw banana and toss it well in oil without mashing it. 4. Switch off the flame, when the raw banana is completely tossed in oil. Serve the mezhukupuratti with Kerala Parippu curry, Sambhar or it goes well with rasam rice too. I served it with Moru Curry. Don't overcook and mash the veggies. It just takes 6 to 8 minutes for the raw banana to cook. Keep very less water to cook. Tempering with coconut oil is a must as like other Onam Sadya recipes.